You may have heard the MIPS assembly language is hard to learn. Or perhaps it seemed hard to you. Well this is completely false. Learning MIPS assembly is easy, putting it in practice whoever might be hard for a lot of people who have an undeveloped logical mind. Now let’s start with Hex. Hex is a base 16 number system while Decimal is base 10. The most commonly used format in hex is a byte. A byte is composed of 2 nibbles. Those nibbles are simply a character from 0 to F.
Those nibbles are composed of bits. While bits and Boolean are stored the exact same way, we use the term Boolean for a value that is either TRUE (1) or FALSE (0) and a bit is simply 1 or 0. There are others, but that’s not important for PSX hacking. An important note about the Little Endian (the data format the PSX uses) is that the bytes are reversed. What this means is that the last byte in a value becomes the first. Note that this strictly depends of the value type; hence how the value is read/written. Note that the following examples show the stored values in hex display without 0x or $, which is because those characters would not only be confusing but would also take a lot of space. Whoever in person to person written conversations, 0x or $ should ALWAYS be used to avoid confusion with a decimal value. Usually the game also reads/write bits this way. The binary 10000000 represent 0x80 in hex. This “1” will be the first bit to be loaded. In order it loads the value 0x80, 0x40, 0x20, 0x10, 0x08, 0x04, 0x02 and finally 0x01. A static value doesn’t change, it is meant to be only loaded. All opcodes (which you will see later) are static. You COULD make some opcodes dynamic but this is seriously asking for trouble unless you are a high level hacker, perfectly sure of what you’re doing and know it will use less space (if that is even possible) than conventional coding. Examples of static data: the WP of a weapon, the HPM of a job, the coordinates of a move-find item, etc. A dynamic value is meant to be changed; therefore a new value will overwrite the previous one. 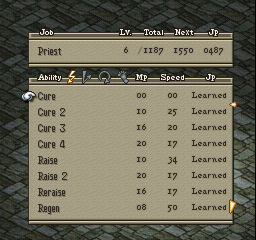 HP of a unit, Max HP of a unit (base max HP calculated, different units, level up, etc. ), total gil amount, etc. 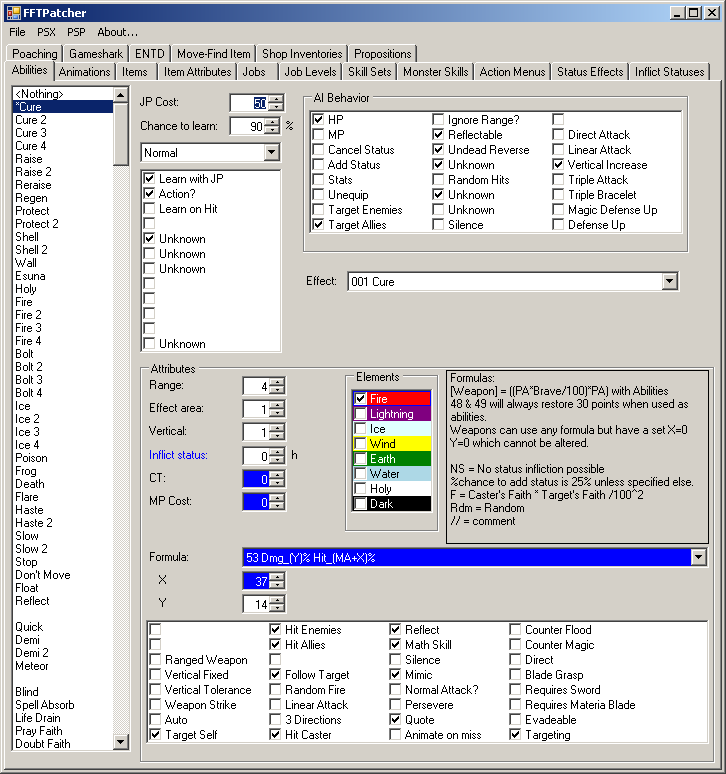 A memory editor will help you finding dynamic data only. 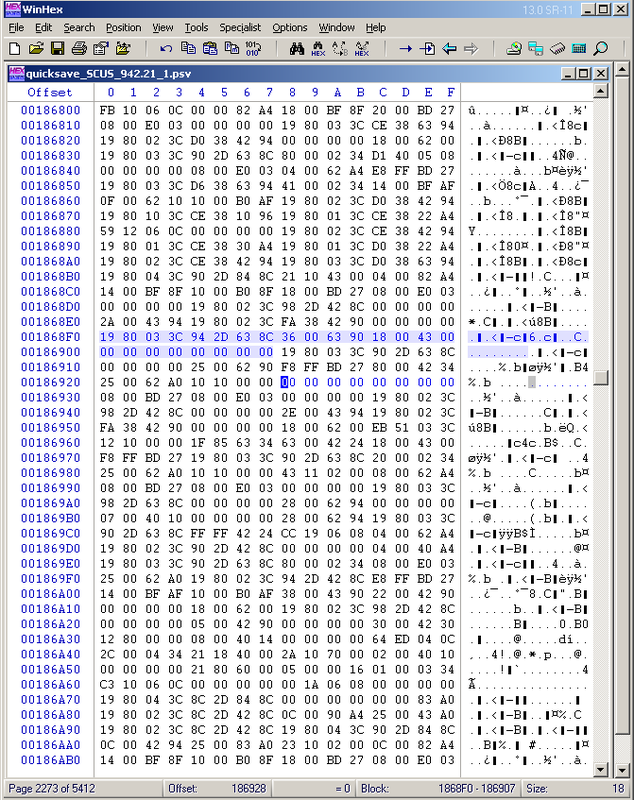 If you search for static data you’re better off using a simple hex editor. Using the memory editor you scan a first time inputting what you know of the value, change the value in game, and make another search with the known modifications to the value. To search for static data, you can either guess what the data is for, or debug using breakpoints on the data. A signed variable can have half of its values positive, and the other half negative. How do we know if a value is signed or not? This all depends on how the value is read/written by opcodes. Now I’ve got you confused. You see, while 0x7F is the highest positive value, the value right after which is 0x80 is the lowest negative value. 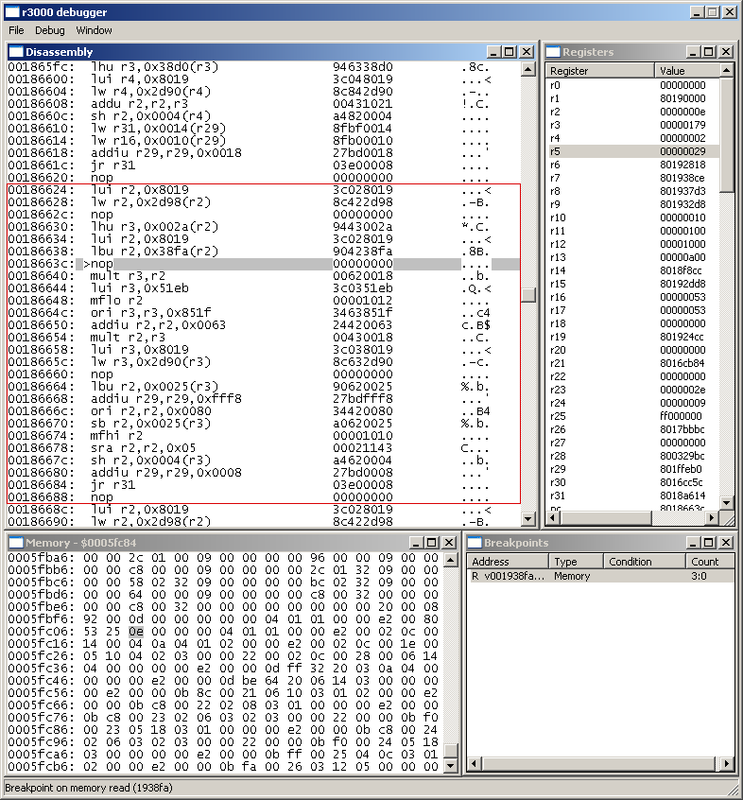 An unsigned byte (which is a normal byte) can have values from 0-255 (x00-xFF). Remember that the value will only be negative if it exceeds half of its maximum value. Of course, the same applies to other variables, except bits. 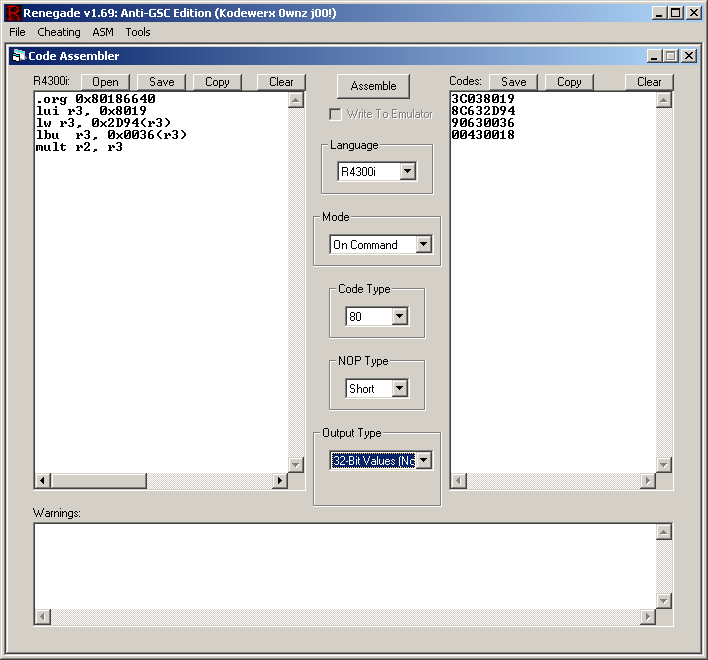 Opcodes are the instructions executed by the console’s processor. Since we started with hexadecimal and binary, we’ll look into the bitwise operands first. 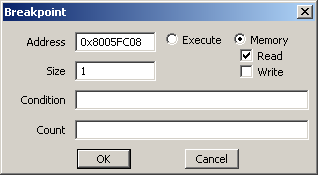 Opcodes will read/write registers depending on what it is supposed to do. Mainly we will work with conditional jumps (branches), jumps, load/write value (from/to memory), and everything else that alters a register’s value. Many instructions have an immediate form, such as addiu (Add Immediate Unsigned) instead of addu (Add Unsigned). An immediate is a half-word value that is within the instruction itself and is static. Some instructions have the variable form, such as SLLV (Shift Left Logical Variable) which is simply the register version of the SSL (which uses a 5 bit immediate). A register is the type of data used by almost all instructions. They are words (so 4 bytes). There are 32 main registers that are directly used by opcodes: r0, r1, r2, ... r31. r0 will always be 0x00000000 so you can use it to compare if a value is true or not safely. AND returns TRUE to rd if both bits in rs and rt are TRUE. OR returns TRUE to rd if at least one of the bits in rs and rt are TRUE. SLL shifts rt's bits to the left by sa bits and stores the result in rd. Excessive bits will be destroyed. New bits are always FALSE. sa can hold a value from 0x00 to 0x1F inclusively. SRL shifts rt's bits to the right by sa bits and stores the result in rd. A few mathematic functions can be applied to registers. Many of them have a signed/unsigned version so make sure you choose the right one depending on your needs. some of them also uses the hi(high) and lo(low) registers. Basically you cannot use those registers directly as they are not part of the 32 first registers. However you can still move a value/from to those registers in your hacks to store temporarly a value, which can be extremely useful in some cases if you want to avoid loading/writing to the game's memory. and store the result in rd. SUB will subtract from rs the value of rt and store the result in rd. SRL Shifts the register’s bits to the right by a given amount. Excessive bits will be destroyed. Because of lazyness and the lack of zodiac compatibility already present in the formula, the outcome of this tutorial will be perfect damage. 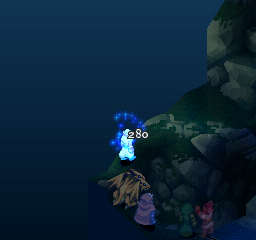 This means the damage cannot be increased or lowered in any way. This is only an example. First let's set a dummy ability for testing. The skill of choice, is as always, Cure. 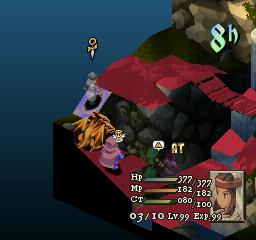 Make a new fresh PSX patch. Now that you have made your changes, go to the gameshark tab and note the addresses, which means the first part of the address. The other half is unimportant for now. 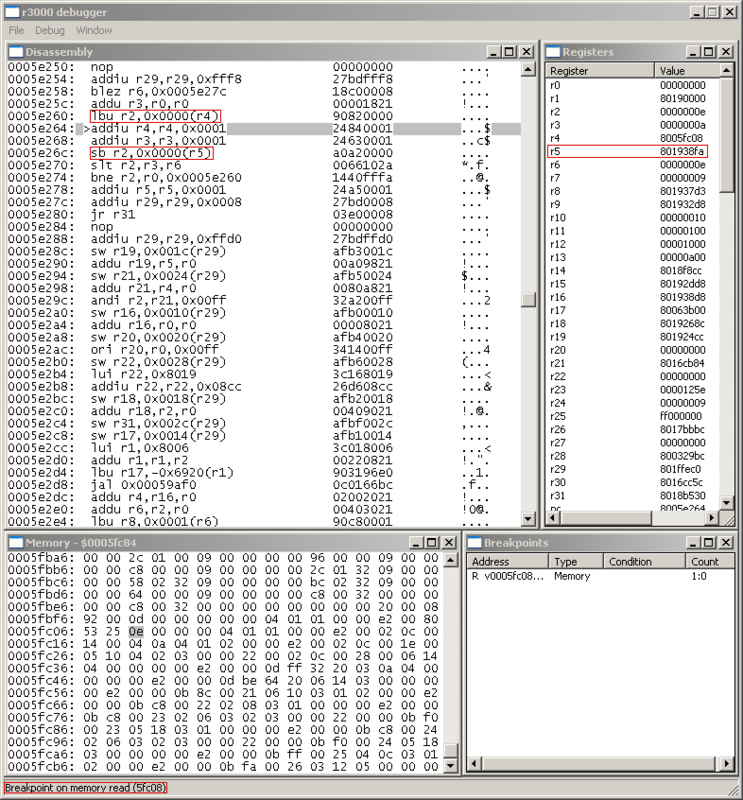 Open the debugger and the memory window. Now head to your first address. To do that, press ctrl+g when the memory address is active, and type 0x5FC05. Now enter the values manually. 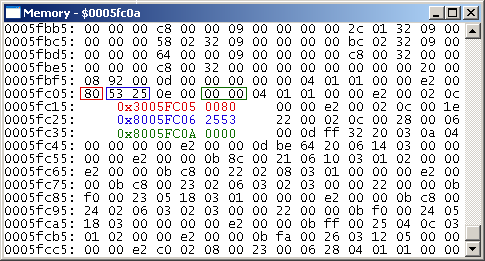 Remember, a gameshark code starting with "3" affects ONE byte, while a gameshark code starting with "8" affects TWO bytes. DON'T FORGET TO FLIP YOUR BYTES!! OK, a bit ugly, but you'll get the idea. 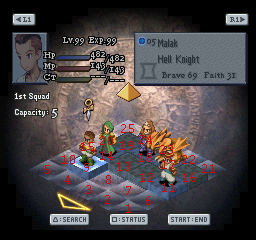 It's always better to know your unit IDs before entering the battle, it saves searching time. Too bad this won't be of any use in this tutorial, but it's very good to know. Now take your unholy cure spell and prepare to target someone, make a quicksave here. Time to add a breakpoint. 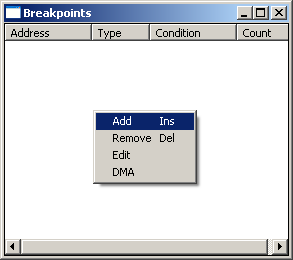 To do this, right click inside the breakpoint window. It will be Cure's Y value. It will be read and stored before the formula uses it. You can use FFTPatcher to get the memory address again if you forgot it. If you look carefully, the byte is loaded and stored again. It was coded this way to always have the X/Y value and other stuff used in a formula at a static location. We simply have to check its next destination, which is 0x801938FA. This will be our new breakpoint. So edit it. I made a square to delimitate the formula routine. It's pretty simple, like anything, it starts after another routine ends (after the jr r31) and ends with one. >> r2 = Current ability's "Y"
>> store r2 = Some value for later use? Now you need to compile this code. Personally I use Renegade64 because I have no idea what other program can compile MIPS r3000. And you need to flip the bytes because Renegade compiled that way... yes, it's a lot of trouble but we don't have much other choice. If you're good with excel you can save some time, unless you really don't have much opcodes like this one. We also need to change "mfhi r2" to "mflo r2"
We should also fill everything else that affects r2 with nop (0x00000000). 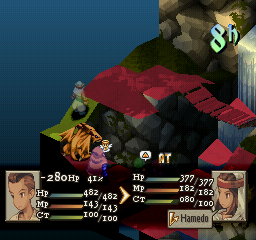 Now to test it, the best way is to use winhex and use your savestate right before taking the action. However, very often the addresses in quicksaves are 0x02B0 higher than memory addresses. 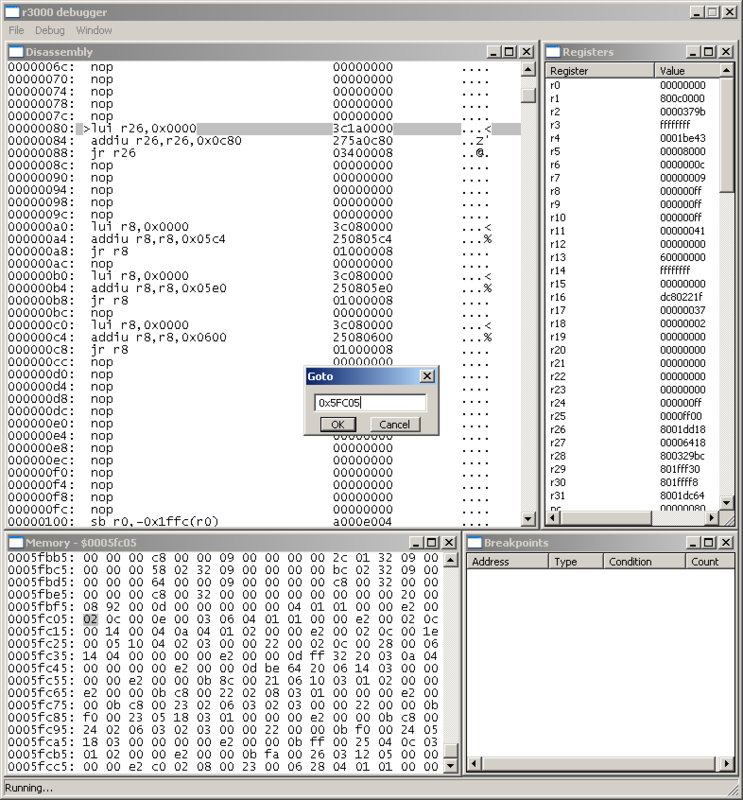 Note that winhex doesn't support "0x" in front of hex. Now load your savestate, make sure you are in hex mode. If you aren't, click the address column. Press alt+g and enter 1868F0. OK.
Now copy/write the new code. To write, press ctrl+b. It's like paste but it will simply overwrite the present data instead of moving it onwards. Now since this is only a formula hack, converting the addresses to BATTLE.BIN is easy. Just subtract 0x67000.